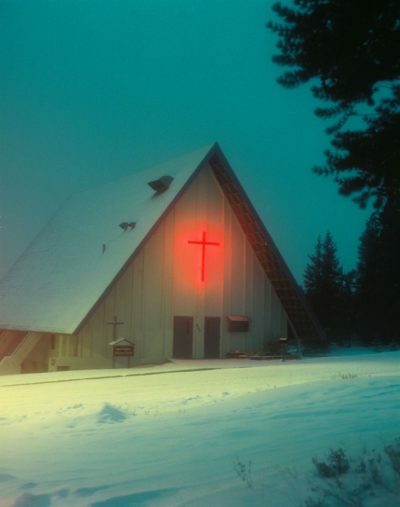 The Church That Came Down the Mountain -Good Shepherd – Leadville | "Northern Crossings"
This picture shows Good Shepherd Lutheran Church in Leadville Co. This was the church that moved down the mountain. I think I have blogged about this before but we used to meet as a church in a Union Hall that had a bowing alley and we knew church was over when the bowling balls would start rumbling. In my memory they were over our heads but memory is a weird thing. We met in a small abandoned Baptist church and a dance studio and all over the place before this church became available. Pastors drove miles over snowy mountain roads to come and serve us at those various outposts. The mining town of Climax up high on Fremont pass was being disbanded because the mountain was slowly being hauled away and an A-frame church was there they we purchased and moved down the mountain to the present location in Leadville. Climax sits at 11.300 ft in Altitude. During her hey day she was the worlds leading producer of MOLYBDENUM ( used in hardening steel) (She supplied 3/4ths of the worlds moly) At one time she had the largest mine tunnel EVER built. She employed over 65,000 people, most of whom never even lasted more than 2 months. Her payroll was well over $80 million dollars per year, with an income of $12 million dollars per year operating profit. Climax originally had a school, a hospital and housing for employees, the school won national awards. And the mine itself won national safety awards in the 50’s. The houses were eventually moved to Leadville and put in what is now the West Park subdivision in Leadville. Many of the houses were loaded up on huge flat bed trucks and moved down Hwy 91, along with apartments buildings which are still used today in Leadville.. The house that I grew up in had to cut in four big pieces and moved with four different trucks, and also still stands and houses people today. My father supported his family of ten by working almost 40 years at Climax, he saw much of the rise and fall of this mine. All that work and dedication from the former generations to get the church and move it and set it in a new place and get Pastor’s and call them to preach the Gospel and administer the Sacraments. It is good to see this picture. It is good to see that they still have snow there.